The bag is great! It holds alot of equipment. My only reason for giving it 4 out of 5 stars is, I wish it had an option of breaking up the large internal compartment into 2 areas. 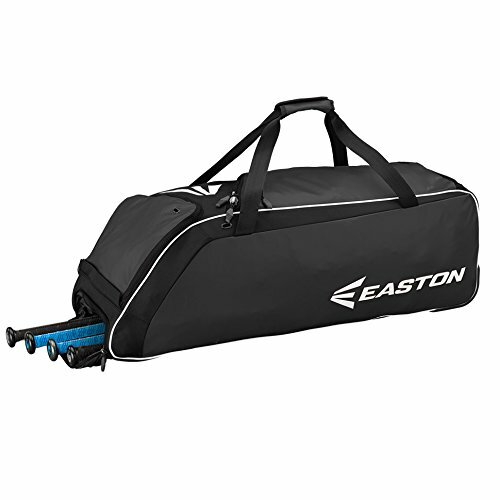 Once you hang it on the fence during a game, everything in the large compartment ends up down at the end of the bag. Love this bag! Fits all the gear perfectly. Loving the wheels option too! 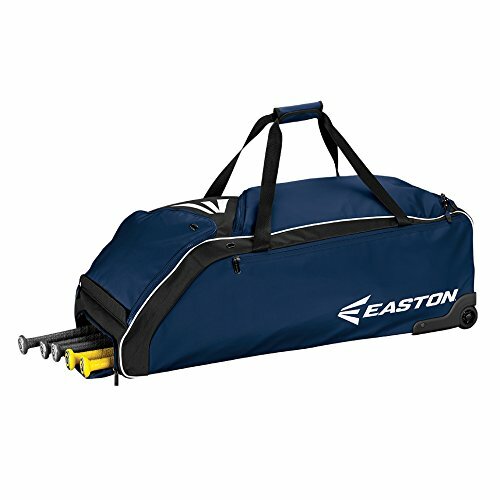 I bought this bag to use for my son's new catching gear. The bag is big enough to fit a youth catching gear set in, but there is not much more room than that. So it works for what we need, although I wish there were a few more pockets on the bag. The pockets that are there on the outside are very small, so I am still looking for a good use on the bag. Overall, the quality of the bag has been good, and it has held up great for the first half of the year. If it holds long term, this could become a five star product, since it is doing exactly what I purchased it for. My Child loves this bag. 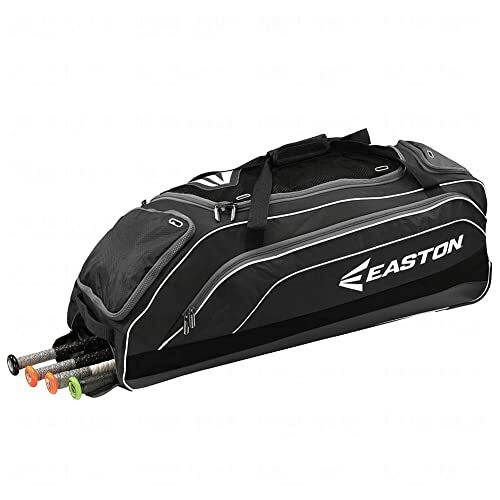 Great bag when your child plays multiple positions. Everything fits! The clips to hang on the fence could be stronger. They still work and we just added bigger, thicker clips. We just got the bag and loaded it up, so we can't give a good review of performance at the field. The bag is a good size and holds all of my 10 yo's catching gear, batting helmet, three gloves, three bats and other stuff. There is definitely still room. One issue I found was that with the equipment loaded the bag gets front heavy and doesn't like to stand up on the wheel end. It topples over onto the bag side. I made a minor modification by screwing a couple of rubber feet onto the handle on the end with the wheels. Now the bag stands up like a champ and the handle won't get destroyed. We'll update when the season is underway. So much room. Can fit all catcher gear, 3 bats, 3 gloves including a batting and catchers helmet. Rolls very well with wide wheels. Fence hangers are sometimes difficult to get both hooks to grab onto fence. Snaps that hold shelves in place need better snap retention. My 9yr old pushes the bag around instead of pulling it due to the bag hitting the back of his heels probably due to his height at only 4ft6in. 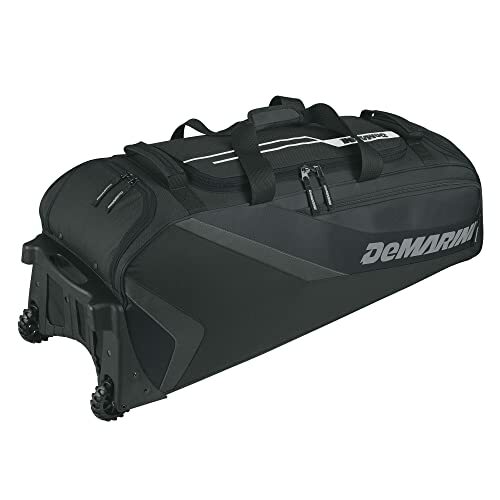 Great bag though and seems very durable. 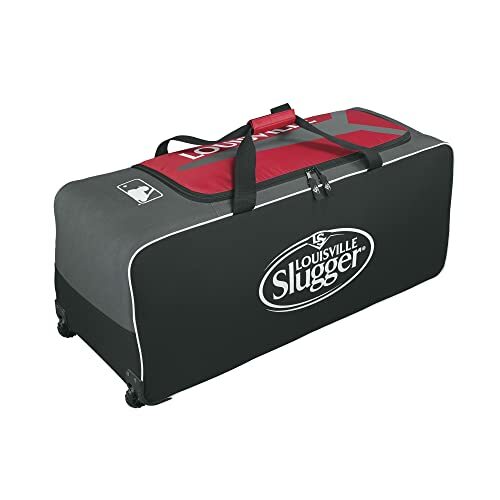 Love the size, compact yet plenty of room for my 8 yr. old son's baseball/catchers equipment. Has 4 sleeves for bats with an additional 2 more on either side of the sleeves. 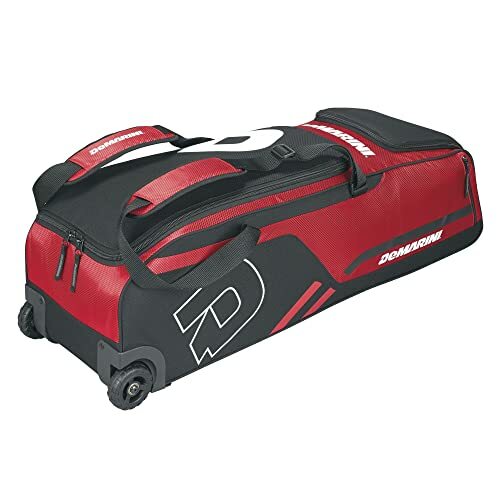 Going to buy another one for my 10 yr. old, replacing his larger rolling bag (which leans to one side). This bag is well made and an affordable price. 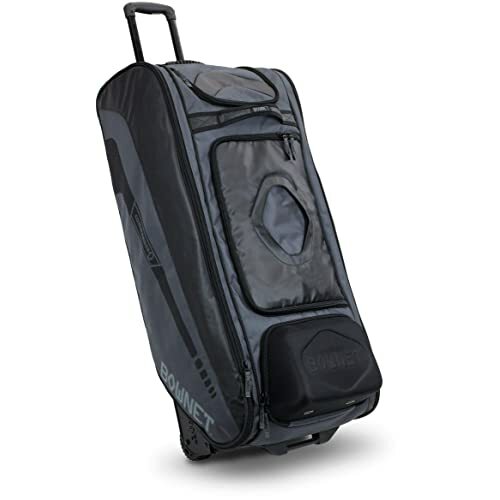 Wheels seems sturdy and the bag holds it shape when laying flat. Easy access to equipment. Only negative I can see with this bag is that there isn't a retractable luggage handle. Bag does have 2 hooks to hang upward on the fence! Very Very Satisfied with this product. My 10 year old uses this bag and it fits a lot of stuff! 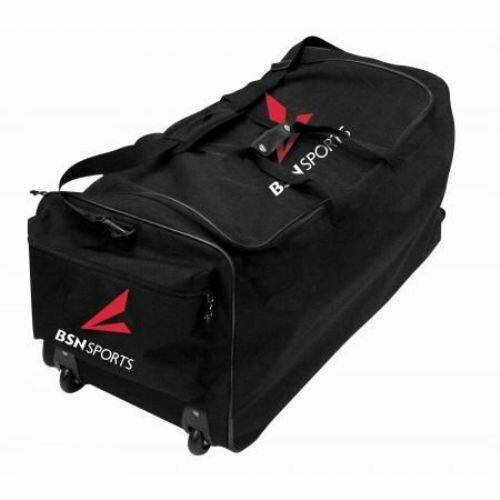 Carries his catching gear in the big compartment and regular helmet and gloves in the smaller compartment. The wheels is a plus! Good bag. I use it to haul tools, pvc parts and electronics down to my ranch in Mexico. It goes through TSA, the airlines baggage and finally Mexican baggage and customs and is still in good shape. I call that a miracle. 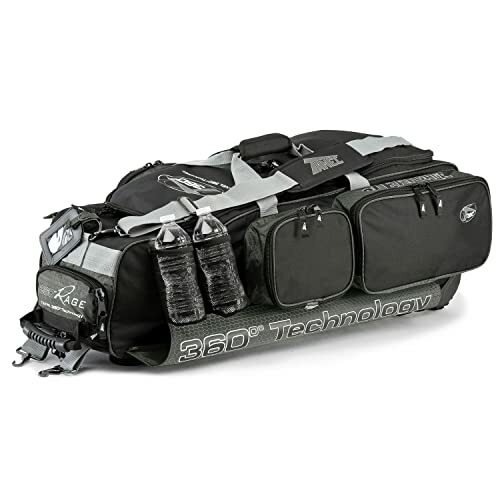 This is a very large and well built gear bag there are no bat sleeves it's more of a gear bag than a bat bag although you could store bats in the main compartment. 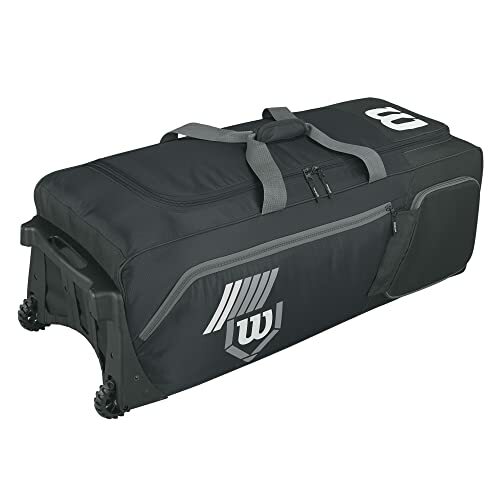 Would be good for team gear or catchers bag. 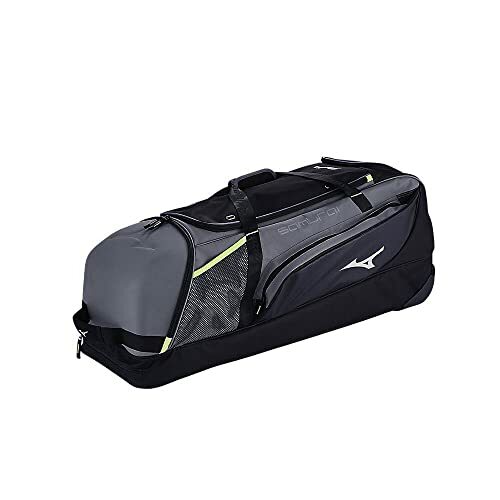 Huge bag, very spacious and fits all my daughters softball gear. Would be 5 stars if the wheels were a little bulkier and the wheel clearance was a little higher as well. Otherwise this is a great bag!!! It holds 2 nets, 2 tees, my catchers gear, and all of my othe trainshirts by aids with ease! 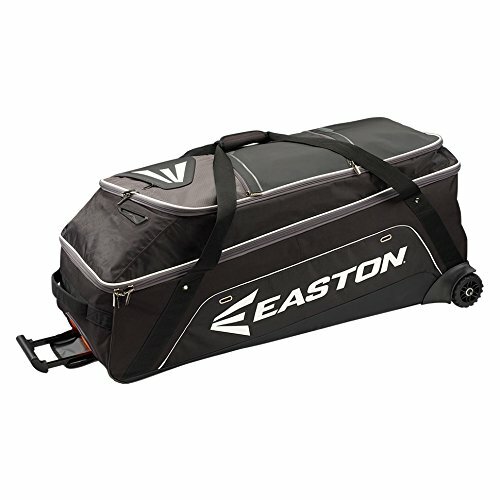 Purchased this as a bag for our girls softball team. 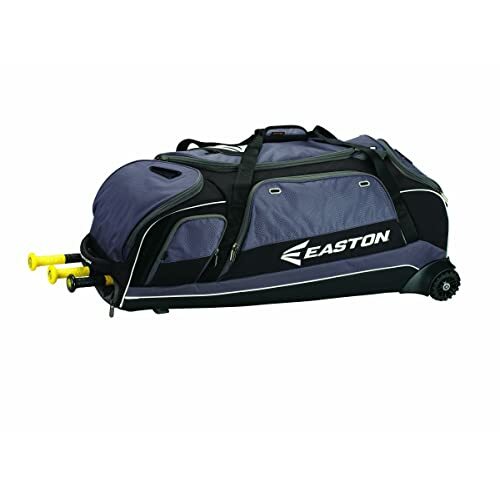 It is huge fits all of our helmets, bags, balls & catcher equipment! I personally love the handle and wheels, making hauling team equipment must easier!! 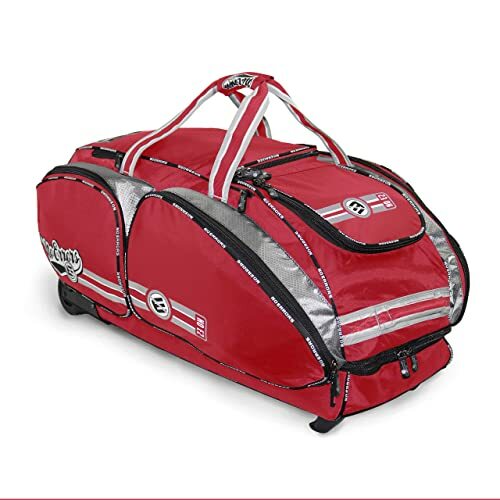 "Great Bag" - by Bobbie S.
Great bag for all my softball gear. I'm getting older, so a wheeled bag helps to transport everything I carry to games. Well made and worth the cost. So far so good. 11 year old plays catcher for travel team, so we needed a bag for his gear. Over the last few months the bag has held up well and has plenty of storage for catcher's gear. 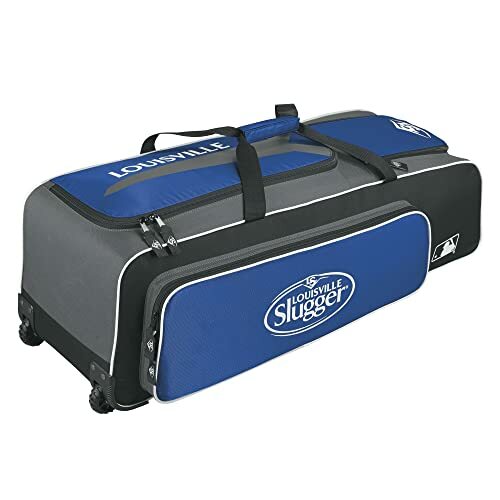 The only issue we've had is that the bag is not rigid and doesn't have any plastic rails underneath, so we just keep two old bats in the bat compartment to keep it upright.